As the leaves change color, the days grow shorter, and the weather cools, you may be considering throwing a Halloween party. Before you let the thought of planning overwhelm you, however, consider this simple guide to creating spooky fun for your kids. 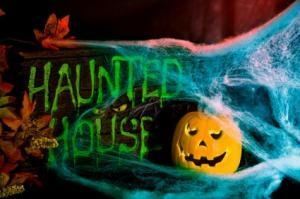 Plan a fun and exciting Halloween party for kids! About a month before the party, identify the particulars of your party. Who: Sit down with your kids and create their ideal guest list. Set a limit on how many kids each child can invite (the size of your venue will come into play here), and help them make appropriate selections. What: While the simple answer to "what?" is "a Halloween party," there may be more questions to answer, as well. Do you want kids to come in costume? Identify any specific theme you'd like to have (such as Disney, cartoons, or spooky creatures), and ask your children if there are any specific activities they would like to include. When: Set a weekend date close to Halloween. Depending on the age of the kids, decide how long the party will run. Two to three hours is usually enough time for young children. Where: Will you have the party at your house? If so, will it be indoors or outdoors? If it is outdoors, do you have a bad weather option? Send out invitations two to three weeks prior to the big event. Several options exist for invitations. Allow your budget, time constraints, and aesthetic to determine which you use. In your invitation, make sure you include the date, start and end time, location and address, information about theme or costumes, and how you would like guests to RSVP. In the 21st century, sending invitations is as easy as clicking a few keys on the computer. An evite is an invitation you send via email to invitees. It can be a simple email, or you may want to use a website that sets up and manages invitations such as Evites.com. If you send an evite, be sure to include all of the same information you would in a printed invitation, including a phone number or email address where they can respond. You can make your own invitations using construction paper, computer programs, or other art supplies. Homemade invitations work best if you are able to hand deliver them, because they often do not fit in a standard envelope. If you make homemade invitations, involve your kids in the process. An alternative to homemade invitations is to use printable Halloween party invitations. Simply download and print these invitations on your home computer. Any general Halloween invitation will work, but a kids' Halloween printable invitation is best. If you need help downloading the printable invitations, check out these helpful tips. Many stores have pre-printed invitations you can purchase and fill in the blanks. 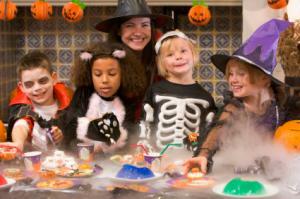 Some websites, such as Zazzle, allow you to order customized Halloween party invitations, as well. If you will be mailing your invitation, then you may be better off purchasing your invitations online or at a store like Hallmark. Your children may also enjoy creating their own decorations from art supplies. 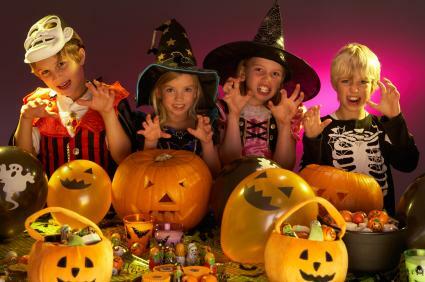 Plan some fun activities for the kids at the Halloween party. Plan a few crafts, make time for treats, and play some games. 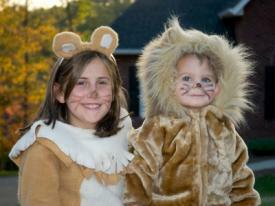 If kids are wearing their costumes, don't forget to include them in your fun Halloween party activities! Mini pumpkin painting: Skip the messy carved pumpkins and purchase mini pumpkins for kids to paint a scary face upon. Spider hats: Cut thick strips of black construction paper to fit around each child's head, and add 8 thin strips on each side of the hat to be the spider legs. Crease the ends so they look more like legs. Stamp art: Set out some thick white paper and a bunch of Halloween stamps and ink pads. Let kids create their own fun scenes. Will you only have Halloween party snacks, or will you have offer a meal? Plan your Halloween party food a week or two in advance. If you will be making homemade party treats, make them the day before the party and store in tightly concealed containers until the big event. About an hour before guests are due to arrive, lay out non-perishable foods and prepare any hot foods or perishables like dips. Make your punch just before guests are due to arrive. Plan a few activities or Halloween games to keep the kids occupied. Prepare the games the week of the party and set them aside. If you will be awarding prizes, then purchase those the week of the party or when you purchase your other party supplies. Fun party games include pin the mouth on the jack-o-lantern, guess the number of candies in a jar, and toss the Tootsie roll in a pumpkin. Plan a costume contest or parade! Party favors don't have to be a big part of your budget, but every kid loves leaving with a bag of goodies. Purchase small orange bags from the stationary store and fill them with small candies, Dracula teeth, and other inexpensive Halloween-themed goodies. There is no correct way to plan for and throw a fun kids' Halloween party; however, careful planning will make the execution much easier. By following a step-by-step plan, you will create a party your kids and their friends really enjoy.